I'm delighted to be sharing my review today as part of the blog tour - please ensure you read to the end and take part in the giveaway! I absolutely loved the first two books in the Butterfly Cove series - Sunrise at Butterfly Cove and Wedding Bells at Butterfly Cove, Click Here to read my reviews - so was eager to get stuck in Christmas at Butterfly Cove, the third and final book. Mia and Kiki are settled in Butterfly Cove with Daniel and Aaron respectively and of course Kiki's two children, Charlie and Matty. Christmas at Butterfly Cove picks up with Mia and Kiki closing down the guest house and cafe for the winter months, Nee is still with them having arrived in the summer but is at a lost as to what to do with her life... whatever happened to her in New York has resulted in her no longer having the ability to pursue her art career and it certainly wasn't worth her running away from her newly wed husband in the middle of the night. Luke on the other hand is angry with Nee despite still loving her, and when the girls' mother sadly passes away he turns up to be there for Nee, giving them both hope that they can salvage their marriage. 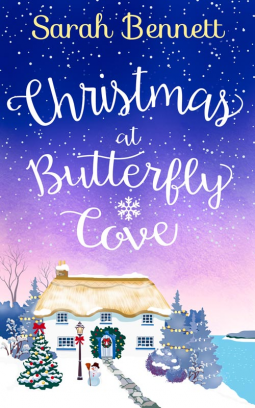 As Luke hatches a plan to convince Nee they are meant to be together, Christmas draws closer and the gang - along with the familiar and lovable sub characters from the previous two stories - all return to Mia's home in Butterfly Cove. Just when you think things are going well for Luke and Nee, something happens to push them apart once again keeping the reader interested as Christmas passes and New Year approaches. What I love about Sarah's writing is her ability to centre the story around Luke and Nee yet bringing us right up to date with Mia/Daniel and Kiki/Aaron with snippets and small chapter sections of their lives - and boy, is there some news to catch up on. As before, Charlie and Matty play great roles tugging on your heart strings, and Meddling Madeline is still being her usual caring, loving, but interfering old self which brings some light relief and humour to the book. I shall be sad not to be returning back to Butterfly Cove - the idyllic location and easy to read style has made this a thoroughly enjoyable trilogy - however I'm already looking forward to Sarah's next book, Spring at Lavender Bay.